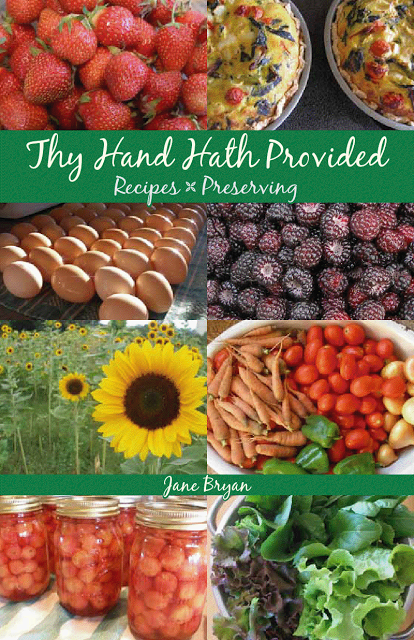 Thy Hand Hath Provided: Cookbook Giveaway! This giveaway is closed. Thanks for entering! It's been a LONG time since I've given away one of my cookbooks. What was I thinking waiting for so long?! Anyway. I'm ready to remedy this little blunder by offering up a free cookbook to TWO readers this week. Just leave a comment below and tell me if you have a favorite recipe from my site. If you own the cookbook already, let me know what you've tried and loved so I can enter you to win one for a friend. If you haven't tried any of my recipes- not a problem. Just click on the recipe tab at the top and let me know of a recipe you'd like to try. Savory Squash Bread Pudding. I haven't tried it, but it sounds right up my alley. Yum! Amy J. O.
I would love to try the Chocolate Scones! I love love love scones. I made them only once, years ago. i love your cookbook! my favorites are the brunswick stew, creamy salad dressing, and strawberry egg soufflé Michelle C.
I cannot remember offhand if I've tried any of your recipes, but looking at the recipe list, the one that popped off the page as one I'd like to try is the chocolate scone recipe! Sounds amazing! Sour Cherry Pie is one of my favorites! I received your cookbook as a gift and enjoy it very much. I think I'll make that pie today! Your pesto recipe is my favorite by far!! I grow basil every year and this was my first time try to make pesto. I used your recipe, love it, and made more the next day to freeze! Next up is butternut squash! Sorry forgot to add my name, Megan C.! The swiss chard and ricotta calzone looks like a good recipe for what's left in my garden. - M. S.
I made the Salted Caramel Apple Bars. They were so good. Would love to try recipes from the cookbook, Thanks for the chance to win. Cindy B. Your 'Fruit and Oats' muffins are definitely a winner! I am for any thing chocolate so "Chocolate Fondue" would be a good place to start. Oh my goodness, I would love to have your cookbook. For the first time, I looked at your recipes and right off the bat noticed your 'Zucchini Pumpkin Bread'. I have a bag of frozen zucchini in the freezer and some canned pumpkin in the fridge, leftover from baking Pumpkin Madelines last week. As I peered into that freezer, I was thinking of how I need to use up that zucchini... I'll try your recipe for sure as I also like substituting things like applesauce, or in this case--pumpkin for oil. Then... I was just racking my brain for what to fix for supper tonight that didn't have meat in it (we are cutting back cause of cost and trying to eat 'heart healthy'), and I see a huge list of vegetarian recipes... awesome! I like the look of the photo of the bow-tie pasta with pesto (?) so will go take a look at that recipe and the others. Thank you for showing me what to make for supper tonight and many more nights! Hope I win a cookbook, but I know it's in God's hands. Have a great day! Your Tomato Soup and Pumpkin Bread are staples in our house. I would love to have more of your recipes! - Kathy K.
Our family loves the Tomato Soup recipe! YUM! Your Pesto and Tomato Panini! YUM. Love, love, love! I'd love to give the Simplified Pastitsio a go. It sounds absolutely amazing!! I am so excited to try the "different green bean casserole". I'm thinking I'll make it for Thanksgiving! I cannot wait!!!! My girls and I made the Salted Carmel Apple Pie Bars. They were delicious. Thanks! I'd like to try some main or side dishes. I printed the recipe for the salted caramel apple bars; I haven't had a chance to make them. I can't wait. Amy P.
For any of you who don't already have this cook book of Jane's . . . oh my, where to begin? I can testify that the Chocolate Scones are wonderful! The White Chili is now one of our very favorite soups. The Corn Fritters are easier to make and 10 times more flavorful than the recipe I made for years. Trust me, this is a fantastic book full of tried and true recipes. If you win it, you'll love it. Or the person you give it to will love it. Thanks for doing the giveaway! I would like to try the Black Bean & Butternut Squash Chili. Sounds yummy. I think I might make it on our wood stove today. Chocolate peanut butter cake - love the combination! Currently, my favorite recipe is the Oatmeal Bake. In fact, I made it yesterday morning before church so that we could enjoy it for breakfast upon our return. What I love about it is that it is very filling and a great breakfast dish for a cold, autumn morning. So far I've used your cilantro sauce, pesto, and cream soup substitutes, but I've been wanting to use the pesto in the pesto torte! The York Peppermint Patty Brownies are absolutely to die for, I would make them every week if my waistline could afford it, lol. Thank you for the opportunity to win! I would love to try the salted caramel apple bars. I am also very interested in the canning recipes as I am going to start canning again. I have done a few things years ago but I am not that experienced. Thanks and I love your posts! I can't wait to try the Sweet Potato Rolls and the Pumpkin Pie for Thanksgiving this year. They both sound wonderful. i havent tried any yet but i am going to! they all look delicious! I think I'd like to try the Oatmeal Rolls. There used to be a lady at church that made Swedish Oat Rolls. I never got her recipe so I'm hoping these are close! I have tried and loved your bean enchiladas. Thank you for the opportunity to win your cookbook. Hello! I love so many of your recipes, but I adore your spaghetti sauce. Anytime anyone asks me for my sauce recipe I send them to your website. It is just perfect sauce every time. Thanks for sharing!!! I would like to try your oatmeal bake. Yummy! I love anything gingerbread, and your gingerbread scones are so delicious! I would love to try your rhubarb crunch. I am partial to rhubarb & that sounds so yummy! Our family loves your chicken zucchini recipe...and your classic tomato soup...and your zucchini bread...many of your recipes have become regulars around our house! Love, love the basic tomato sauce recipe!! We LOVE your baked oatmeal! It's a special treat (with chocolate chips) when cousins come over. Kaytee Lou ~ I am not afraid to can fresh fruit anymore. Thanks for giving me confidence. I love your Caramel Popcorn recipe & make lots of it during the Holidays. Banana pudding dessert. We were looking for a banana pudding recipe and stumbled onto your site. So glad we did. We picked your recipe over others because it didn't use the box mix most call for. We loved it. So good! Don't have the cookbook but would love to try more recipes. Jennifer S.
Raspberry Applesauce Jello Salad and My Favorite Pie Crust are two I make often. I just found your blog, so I haven't tried any of the recipes -- yet -- but like the looks of "My Grandma's Potato Salad" which seems a lot like my mother's version. But I want to try several others, as well. The Apple, Sweet Potato, and Sausage Bake are a family favorite!! I would love a copy of your cookbook!! Diane E.
Yippee! I want to try the Classic Tomato Soup and the Pizza Dough. Love your cookbook! Kool! Enjoy your site.. never tried recipes yet.. I am interested in your vegetarian main dishes as well as learning how better to coordinate gardening and preserving and then largely eating it up before it is time to put up more. I won't live long enough to figure it all out all by myself. Thanks for sharing your wisdom. Mmmm...your Raisin Bran Muffins sound wonderful ! Am going to try em ! We had your sausage with yam and apple for dinner tonight. My husband loves that one! Thank you for your generous give-away opportunity! Your curried chicken pot pie is a nice twist on an old classic! I love it when I want to make something I'm familiar with but bored with the standard. I really love your quiche recipe and make it frequently. I made it for friends I am visiting and they were raving about it! There are so many goodies to try in your book! Things I would like to try for sure are 5 minute bread, caramel popcorn - we all love that recipe, and frozen ice cream and yoghurt. It will be exciting experimenting with your recipe's! Oooo the salted caramel apple bars sound good! I found your site thanks to Mavis. I can't wait to try funny cake. Just that name intrigues me. Hi! Mavis at One Hundred Dollars A Month sent me over to look around! Oh my, all of your recipe's sound so yummy! I think I'd have to pick Apple and Sausage Pie & Classic Tomato Soup. :-) I might just try them this weekend anyway. :-) Your cookbook looks like it would be well used at our home. Will try your spaghetti recipe for sure! Corn fritters as well. I'm happy to have come across your blog and contest via Mavis. I am also a homeschooling mama of 8. Heather H from WA. Thanks! I'd love to learn how to make the Naan bread. That looks scrumptious. The recipes all sound relish! I'd try the sweet potato and sausage soup first -- I bet it's yummy. Thanks for the chance to win a copy of your book. Mother R Peanut Butter Cookies sounds delightful! Plus, Mavis sent me!!!! I love Naan bread and can't wait to try out your recipe for it! Yummy goodness! Mavis sent me your way and your recipes all look wonderful! Brunswick stew is one of my favorites but I've never made it myself. Thanks for the opportunity to win what looks like a winner of a cookbook. Hello Mavis sent me over to your site and I think that I will be sticking around. I would like to try your Curried Chicken Potpie, sounds yummy! Your cookbook looks great too. I have recently gotten back into preserving, grew up doing it with my mother. Thanks. Grammies Peanutbutter pie is yummo!!!!!! Oh my! So obviously I want to test out your funny cake. My family has made Wacky cake for years. It is a chocolate cake that doesn't use eggs, but vinegar instead. Forgot to mention that Mavis sent me! Mrs. R' s Peanut Butter Cookies are wonderful. Makes my house smell like the cookies of my childhood when I would come home from school for lunch.Yum. My name is Candy. Brunswick Stew. Sounds so good for a cold, windy, rainy day. Your cookbook has been on my list for a long time so I am so happy you are having this give-a-way! Can't wait to try some of your homemade ice cream recipes, but the whole recipe list looks amazing! Thank you for hosting this giveaway! Michelle B. Chocolate scones. I would love to have your cookbook. I keep reading about how delicious the recipes in your cookbook are from Mavis @ $100 a Month. I started reading here because of that. Anyway. Those gingerbread scones look mighty tasty. Hi, I came over from a link on Mavis's blog. I have enjoyed reading several of your post , and would love to try several recipes. Oatmeal rolls, naan bread and carmel apple bars just to name a few. I would love to try Curried Chicken and Rice Soup on a cold night! We love, love, love your Classic Tomato Soup recipe! It makes dinner on a busy night so easy, and it is delicious!